Save on the cost of professional rug cleaning by doing the job yourself, using a clever technique from yesterday. 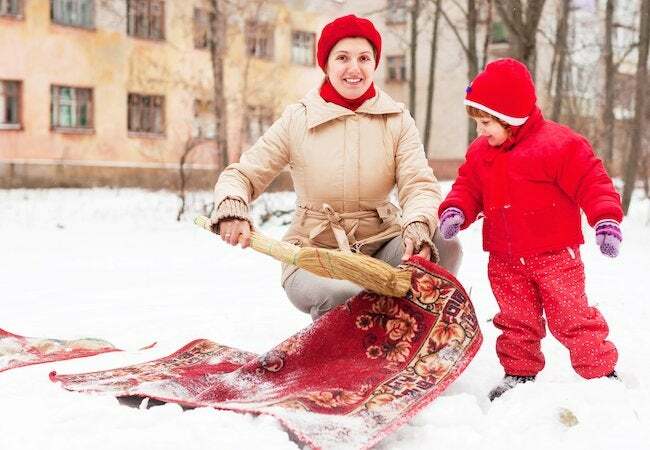 Before hauling your rug outside on a cold day after a snowstorm, first vacuum its front and back. Alternatively, shake the rug well, releasing all the loose dirt and debris. Next, let the rug sit outside and acclimate to the temperature for about 30 minutes. Don’t skip this step! There are two good reasons for the waiting period: One is that this exposure to the freezing weather will cause accumulated grease and grime on the rug to harden and break up. Equally important is that once chilled, the rug is not likely to melt the snow it’s soon going to lie upon. That’s critical, because if the rug were to be warm, this process would leave it a wet mess. So once and only once the rug is good and chilly, go ahead and lay it face down in the snow. Next—this is the best part—proceed to beat it with a broom or rake or whatever you have on hand. If you want, you can simply walk back and forth over the rug, but it’s better to use a long-handled tool. You don’t want to crush the rug into the snow. Instead, the goal is to create vibrations between the textile and the snowy ground. When you get tired, flip the rug over and repeat the process. Finally, pick up the rug and carry it back to your deck, porch, or patio. Shake out as much excess snow as you can, then hang it with clothespins or fold it over a railing. Leave it for about 30 minutes. That should be enough time for the snow within the weave of the rug to turn back into water vapor. When you’re putting the rug back into place indoors, you can admire its renewed colors and the fact that, while it may have been looking the worse for wear, it now looks virtually new!